Tarantino is back with his first film since his Kill Bill outings and has managed to produce his best film since Pulp Fiction. Now I love Kill Bill and Jackie Brown is nothing to sneeze at either but Inglourious Basterds might just be the film of the year. In any genre. Set in Nazi-occupied france in the 1944, Lieutenant Aldo Raine (Brad Pitt) leads a fearless crew of Nazi killers dubbed 'The Basterds'. Deep behind enemy lines, the Basterds take no prisoners killing as many Nazi officials they can get their hands on and leave no man un-scalped. Christoph Waltz earnt himself the best actor award at the Cannes film festival for his portrayal of Nazi Colonel Hans Landa aka "The Jew Hunter". The name pretty much sums up who the Colonel is in this flick, a smart, ruthless... Jew Hunter. He is the standout actor of the film and I have to give it to QT for casting the perfect actor. Tarantino said that he was willing to pull the plug on the whole movie if he didn't get the right guy for the job. Folks, he got the right guy. After we see The Basterds Kill a few dozen Nazi soldiers, they get sent on the ultimate mission. They head to Paris to attend the premiere of a Nazi flick being attended by some of the highest ranking officials in the Nazi military. As Mike Myers said in his cameo as General Ed Fenech "We have all our rotten eggs in one basket. The objective - Blow up the basket". 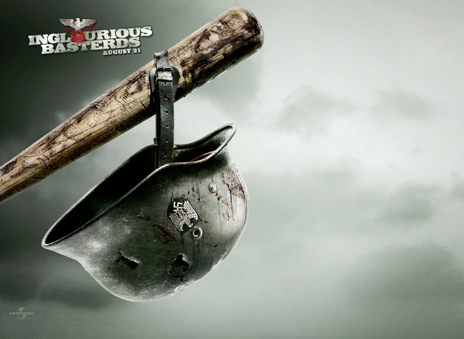 Inglourious Basterds, like Tarantino's other films is funny, but it's not a mainstream obvious funny. It's in the acting and the dialogue and the story. I love it... and so will you.